My nephew/cousin Rasul has requested PEACH COBBLER. Here ya go, BABY, let me know when you make it and how it comes out. Peaches are not in season, so I am using frozen peaches. I NEVER use can peaches! What makes a peach cobbler to die for is the crust and the juice. Everybody cannot make flaky pie crust the first time around so to ensure this the best cobbler he has ever made I am using a ready-made crust. 3 boxes refrigerated ready-made pie crust, 4 1/2 cups frozen peaches, 1/4 cup light brown sugar, 3/4 cups white sugar, 1/2 cup butter, 1/4 cup heavy whipping cream, 1/2 teaspoon ground cinnamon, 1/8 teaspoon ground nutmeg, 1 teaspoon lemon juice, 2 teaspoons cornstarch. Preheat oven to 400 degrees. Lightly butter a 9×13 baking dish, set aside. Remove 1 pie crust circles and put it on a cookie ship put in oven cook until golden brown. Get out a large saucepan add the sugars, cornstarch cinnamon, nutmeg, butter and lemon juice, stir everything together, cook over medium heat for 2-3 minutes. Add cream and peaches continue to cook until the juice thickens, bring to a boil for about 1-2 minutes. Remove from the heat. Taste, adjust sugar and dry seasonings as needed. Add crust to the bottom and sides of the dish. Add 1/2 of the peach mixture to the dish. Put the cooked crust in the dish. Add the remaining peaches. Cut the remaining crust into slices. 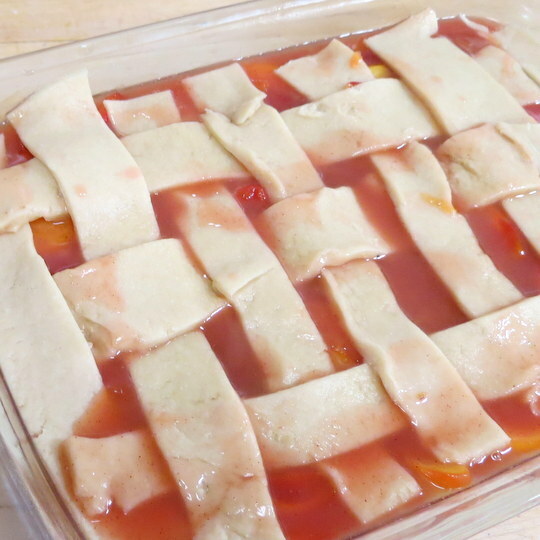 Make a lattice pattern on the top of the peaches. Put in the oven and cook for approximately 25 minutes. Remove from the oven and dot the crust with pieces of butter and lightly sprinkle sugar. Return to the oven and cook for another 5 minutes or until the butter melts and the crust is golden brown. Serve warm with a scoop of vanilla ice cream on top.